Today we feature three awesome Game of Thrones parody tees by a relative new comer to t-shirt design, Firepower AKA Nick Heazell from Cochrane, Canada. It hasn’t taken Nick long to make a splash and build up an impressive portfolio with his clever mashups and pop culture references. With designs inspired by television and film including Game of Thrones, The Walking Dead, Monty Python, Star Trek and Star Wars, there’s bound to be a design that speaks to the geek inside just about everyone. You might think that each of Nick’s three (so far!) Game of Thrones parody tees exist in a vacuum. Sure, they each include the iron throne as the backdrop, but the central figure in each is a character from another fictional universe. However, Nick has pointed out that each of the central figures also share something in common with Ned Stark (Ned Stark appears in a promotional poster for the first series of the television show, in the pose each character mimics in the designs.) So, let’s talk about each of the designs, in order that they appear in the image above. The first is Game of Clones, this one is a Star Wars mashup obviously, featuring the Clone Trooper helmet. I think it’s apt that both Clone Troopers and Ned Stark are sort of clueless to events around them and likely to lose their heads. However, it is a lot less shocking when a Clone Trooper bites the dust! I think this one looks quite good as both universes wear body armour and helmets – although separated by centuries, or perhaps dimensions of technology. 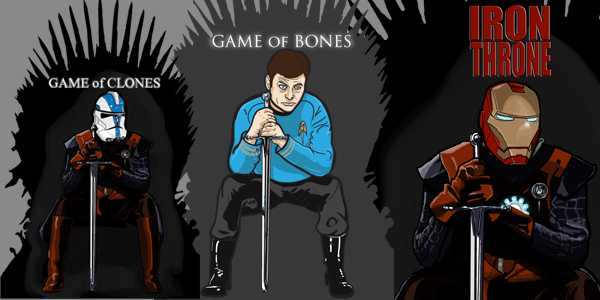 Next up is one for the Trekkies, Game Of Bones, featuring Leonard “Bones” McCoy looking pained under the mantle of leadership – as always. McCoy’s typically grim and speculative look is a great fit for the weight that sitting on the Iron Throne carries. Finally is Iron Throne which has Iron Man sitting on it aptly. Did you notice Ned and Tony share the same last name? How about irony of Iron Man sitting on the Iron Throne… strange coincidences indeed! Perhaps the similarities between Ned Stark and a Clone Trooper, Dr Leonard McCoy and Iron man are a stretch, but I quite enjoy that extra level of intertwinement that somehow deepens and justifies these mashups. The designs are printed using cutting edge direct to garment technologies on 100% cotton, American Apparel tees. They’re available in four t-shirt styles for guys and gals. Don’t miss out on the latest from Nick, you can follow him on Facebook and Twitter. And, if your interested into a deeper insight of Nick’s design process, checkout his detailed design blog.